The Salvation Army of Coastal Alabama serves a traditional hot turkey and ham meal to ANYONE who would otherwise go without on Thanksgiving Day. 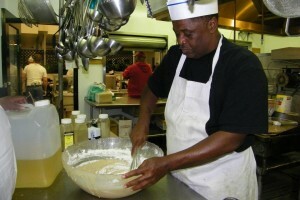 Chef Cecil Morris and his staff prepare to feed 1,000 people each year. It takes a week of preparation and nearly 150 volunteers to serve our restaurant-style meal. Then about four weeks later, we do it all over again for Christmas Day! The meals are served from 11am – 3pm at our headquarters, 1009 Dauphin Street. The Salvation Army relies on the generous donations and food drives from our community to make the Holiday Dinners possible. Please call 251-438-1625 if you can help us provide this holiday tradition for those in need. Remember, The Salvation Army of Coastal Alabama serves dinner to homeless 365 days a year. Volunteers are welcome to help serve a meal any day of the year!